Is My Baby Right-handed or Left-handed? 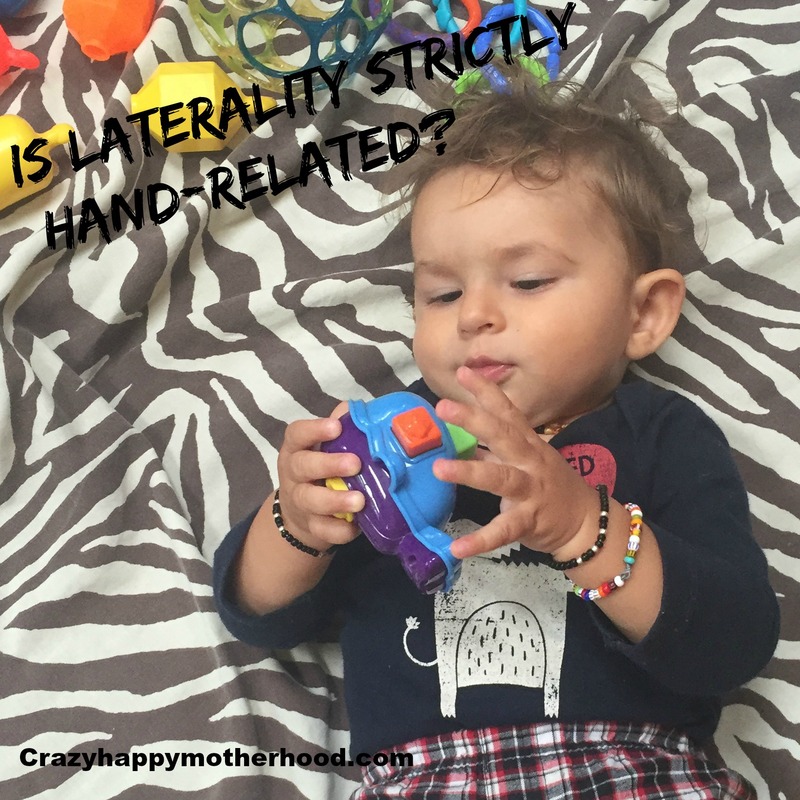 Is Laterality Strictly Hand-related? Not until the age of 3-4 (some sources say 2-3, as always, babies are individualities) can we talk about absolute laterality. Once babies start grabbing things, they may prefer one hand over the other. But before the age of 1 they actually should be using both hands and experimenting with both parts of their body equally. If they have very strict preference at this age, it could be because the parents hand them objects into one hand only; then it’s good to switch the hands here and there. If this is not the case, it’s good to check (preferably with assistance of a pediatrician) for a possible muscle weakness or underdevelopment. When talking about laterality, most people think about hands first. But laterality refers to a preference for a whole body side. Humans’ ear and eye laterality should be ideally identical with hand laterality. If it’s not, it could lead to learning problems in the future – it may be crucial in the way a child processes information. So as we, parents, anxiously watch for the “handedness”, we should watch for possible signs where a child is using one eye or ear more when forced to choose. Breastfed babies are in a slight advantage when it comes to eye and ear stimulation – they get usually fed from both breasts, so primary sound and vision stimulation changes with each breast. Bottle-fed babies tend to be held in the same position when being fed. If you have a bottle-fed baby, you might try to stimulate him in different positions. The same applies if your diaper changing station is by the wall with a parent changing always from one side. You might consider either changing the side with each diaper change or, which is even better for you and the baby, move the table so the baby’s feet are towards your body and you look at your baby from above. This is by the way the most preferred diaper changing position in Motessori-style upbringing. Look, I’m drawing a blue square! Will you help me colour it? Now we’re making a red circle. You can even make it a pre-diner game when one partner is preparing the meal and the rest of the family is waiting at the table (and you have a brand new family ritual!). While ambidexterity (equal skills with both hands) is very rare, children are natural learners and using both hands for easier tasks is a game for them, so even older children can take part and try drawing the same easy shape with each hand taking turns. Just remember – we all are unique and possess individual nervous systems – you cannot change your baby’s laterality and you SHOULDN’T try.